11 year ago was the game of Maria's historical £100k win. The studio went absolutely NUTS at the end! Her game pretty much saved the cursed month of September. At least people weren't too affected by the bad games during Battle of the sexes, it wasn't until a year later that things really started to go bad for the month of September. If the Battle of the sexes games happened a year later, Theresa would've been utterly terrified and dealt at £20k at 8-box! Of course the other thing about Maria's game was that it marked the debut of the infamous CJ's short-lived stint on the wings before she was out on ear, never to be seen again due to alleged conflict with the other contestants off-screen, taking the walk of shame instead of the walk of wealth.....oh right, sorry, wrong show! Her box openings did seem oddly edited too, as they were giving her as little camera exposure as possible, she got no closeups, they only showed her when she opened her box or someone standing beside her opened their box, when she was chosen to open her box, they abruptly cut straight to her box opening and didn't even show her reaction after her box reveal, Noel didn't welcome CJ as the newbie or even mention her in Maria's game nor did he mention her being gone in Bernie's game just over a week later, and was it true that her voice was edited when she opened her box in Stuart's game? Contrast that with the summer of '06 and 'Double Deal Week', when several million people just couldn't get enough of Deal or No Deal. I was on holiday in Spain - as I announced at the time with a whole thread dedicated to this incredibly important issue, in something like the second post I'd ever actually made on the forum - and for so many reasons, those few weeks were unforgettably brilliant, with Double Deal Week bouncing around in the mix of great memories as I look back on it tonight. Stevie the 'black widow', daniel4389, Nessie, Kestral, Wayne the...Fireman? Something like that, who had £999 in all his offers and a terrifically disappointing game; Wakey, Carlton, J.R. Them were t'days. Oh god, how the hell did i manage to forget mentioning Jean the Grinning Reaper in this post?! She was one of the big ones on the show at that time. I remember she couldn't stop revealing the top 3 in her first 5 shows, then she started to dilute a bit and became more mixed. Some other memorable moments from Jean when she wore a necklace with the number 13, in one game she gave some advice and said something like "Don't listen the audience, they want you to crash and burn!" and of course, her making a surprise guest appearance on the Halloween show weeks later! By the way DANIEL, i just went back and read your closing post on £5,100 Pete's game thread! So it's now been over 13 years since the show started!! And on this very day in 2005, the £250k made it's first EVER appearance on the table, just 10 shows in.....except Natalie had already dealt at £22k at 8-box! It almost happened twice in a row with Maurice the following day too, but luckily he only had 50p in his box. I suppose acting as if the show's been around forever kind of led the viewer into having the same mindset, hence the sensationalism having optimum effect. That was just Noel over-exaggerating a big win, just like when Chris Tarrant said that the first WWTBAM £125,000 winner was "the biggest winner on a quiz show IN THE WORLD" (Tic-Tac-Dough's Tom McKee and all 9 couples who won the grand prize on the $1,000,000 chance of a lifetime unquestionably won more) and more recently Bradley and subquently Daily Mail claiming that the recent £100,000 win on The Chase was the biggest win in daytime quiz show history. Yes, it was Noel over-exaggerating a big win, which is exactly what I said! 11 years ago, Shaz took advantage of the first ever FUTURE OFFER from the banker and was rewarded beautifully with a great win of £25,000! I actually think the show started to decline after Shaz's game. Despite the controversies of £1k Michael and Helen B's post-game handout, i thought early November was great as it had good moments with box wins that weren't OPW's but still satisfying results (Charly, Nicki, Mary), Stef having a great OPW for £25,000, and characters like Basil Fawlty Peter, pealpixie Simon, Denis and JC, and the "mummies" of the group were also played up as big characters at the time too. Last edited by JamesJMH91 on Tue Jan 01, 2019 10:37 am, edited 1 time in total. Happy New Year all! And Happy FIFTH Anniversary of Joey's game and the introduction of box 23! Happy New Year to you as well and everyone else! I haven't been to the forum for a very long time. I was prompted to do so as have been catching up with the new series of DOND US on youtube! Yesterday was the 13th anniversary of the game of Julie Walton who sold a 1p box for £33,000 and held a record that remained unbroken right up until October 2010 - The largest proportional win! Yesterday marked 5 years since Peters Game In Which On a 750/10k finish, he declined a lousy £2,375 as he believed a red was on the table, unfortunately it wasn't. So he purchased box 23 with the £750 and went home with NOTHING. The most heartbreaking show in which someone left with nothing. Today is 3 years since Bobby Hall played and got +£10,000 from box 23 after an emotional end to the game after he had originally won £500. Why are we still documenting these anniversaries? The show has been off the air for nearly three years now. It all seems kind of pointless to me. On that note, let's do something a little different. 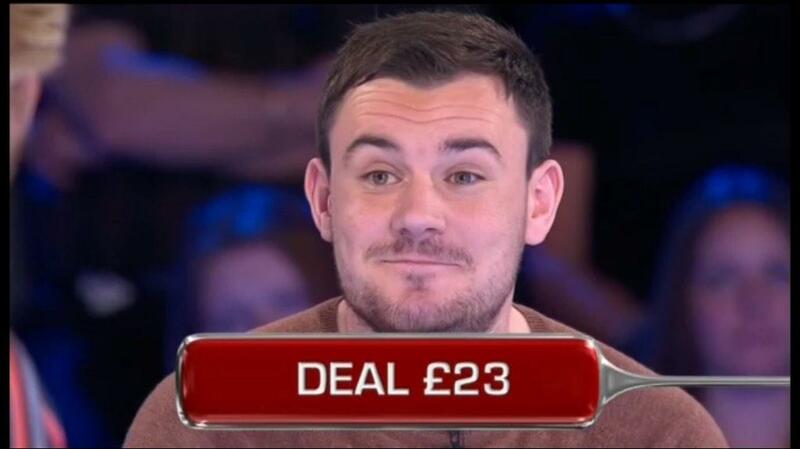 He had an extremely strong game, turning down offers of £8,000, £15,000, £20,000 and £41,000! Despite the loss of the £250k in the fifth round, he had an amazingly strong final 5 of £15k, £20k, £50k, £75k and £100k, and the banker offered EXACTLY the average of £52,000....which Giorgio REJECTED!! Question is, was Giorgio reckless or not for turning down an on-the-mean offer on the board he had? So now we’re documenting fictional games? If that’s not grasping at straws, then I don’t know what is. I think the best thing to do in this case is to let pointless threads die. One anniversary worth remembering - 10 years ago today, our own site admin man h2005 played! Bananas, furniture polish, strange dances and ghosts all featured... Those were the days.